If you are serious about your culinary skills and like to create great meals, you need to be using the best quality cookware sets and utensils you can afford. With quality kitchen sets available at affordable prices these days, there is really no excuses for making do with cheap pots and pans! Welcome back again to this great blog, where I want to look into the many possibilities that are open to cooks everywhere to get the best from the utensils they use in their kitchens when preparing and making meals for family or friends. A lot of work goes into producing a great meal, so you don't want things to go wrong because you skimped on the quality of your cookery set! Let's fine tune some ideas on what constitutes good quality kitchen cookware in general. After all, it's good to know what we're dealing with and what we don't want to be using when it comes to preparing and cooking great meals. The first test is your own judgement in just knowing what's right for you. Superior quality looks and feels right when you hold it. The item will feel heavier than run-of-the-mill products and will feel sturdier and solid. Hardware will come with a manufacturer's guarantee, with the best products having a lifetime guarantee. This is a sure sign the maker's believe their products are long lasting and they are prepared to back up their belief with a cast iron guarantee. The material an item is manufactured from is also important. If you prefer working with stainless steel or cast iron, these should be robust with strong handles that connect to the body securely, preferably with solid looking and feeling rivets in preference to welds. Pans should have a heavy, dense base to disperse heat equally over the surface and provide for a more even cook, while reducing the possibility of burning food. Hardware should be oven-proof, with solid, comfortable to hold metallic handles that will not be easily damaged with heavy use. Good quality cookware will last a lifetime if it has been looked after properly. It will provide you more opportunities for discovering your unexplored talents in cooking while ensuring you have the best tools to work with. So what's the first step in upgrading your hardware and taking it to the next level? 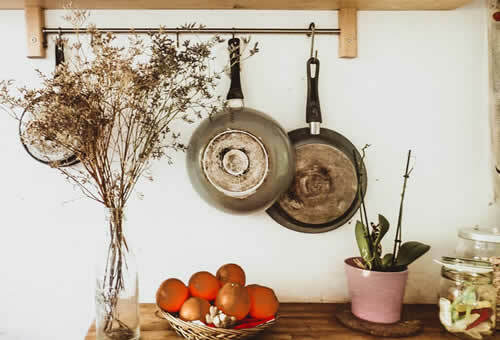 Begin by throwing out those cheap saucepans that probably have been causing you no end of swearing and hassles and go buy something you'll enjoy using! Really! There is no enjoyment to be had from using cheap equipment that gives you grief when it comes to cooking something important. For years, I put up with cheap pans that heated food unevenly and often burned whatever was sitting at the bottom of the pan. As soon as I got rid of my cheap junk and spend some serious money on top quality stainless steel equipment, my enjoyment increased along with the consistency of my cooking! I really like the feel of heavy pans that distribute the heat equally across the heavy base. I also love that I can take any pan off the hob and put it in the oven if needs be (great for casseroles), knowing it will be equally at home in there as it is on a gas ring. Personally, I get a real feeling of happiness when I'm using the best quality pots and pans money can buy. Everything has a cost, but it is offset by quality. Pots and pans should be of the best quality you can afford, no exceptions! So now you have my own thoughts on what constitutes good quality in the things I use in my kitchen, you can take it away and put it to good use when reorganizing your own.